Durable construction insures years of heavy use. All stamps guaranteed against defects in workmanship and material under normal use and proper care. 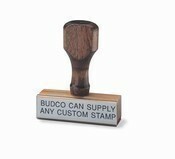 If you need a specific/custom stamp, or large quantities, please call for a quote. Priced each.